The husband of Michaela McAreavey, who was murdered while on honeymoon in Mauritius, has said he saw one of the accused outside their hotel room twice on the day she was murdered. John McAreavey has been giving evidence at the trial of the two hotel workers accused of the murder in January last year. 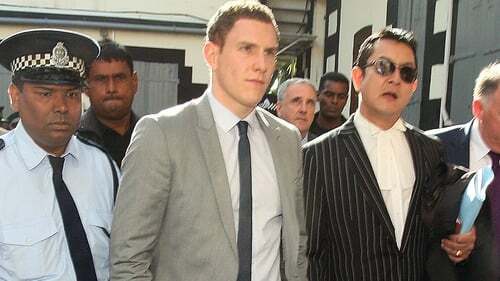 Mr McAreavey said he saw Avinash Treebhoowoon on two occasions within a number of minutes the day his wife died. He said at one point earlier that day he went back to his room at the Legends Hotel when Michaela was inside, and there was a ''Do not disturb'' sign on the door. Mr McAreavey said he was in the room for five minutes and when he emerged the accused was outside the door. He said Mr Treebhoowoon asked whether he could go in and clean the room. Mr McAreavey told him: "No, come back in a few minutes." Mr McAreavey went back into the room, coming out a few moments later and Mr Treebhoowoon asked again if he could go into the room. Mr McAreavey said it seemed strange to him that Mr Treebhoowoon asked twice if he could go into the room. In cross examination, a defence solicitor said it was his information that Mr McAreavey had only seen Mr Treebhoowoon on one occasion that day. Mr McAreavey, who described his wife in court as the most beautiful woman he had ever seen, broke down several times while giving detailed evidence. Mr McAreavey said he fell to his knees and prayed after trying desperately to revive her. "Michaela was cold," he said, his voice halting. "And her lips were blue and I kept on just saying 'Michaela, Michaela, wake up, come on, come on'. "Then I could see this mark on her neck. I didn't know what was going on, I didn't know what was going on. I was grabbing her and trying to press on her chest and trying to attempt CPR. I don't even know CPR. "I was just holding her in my arms, telling her to come on, just to wake up." The prosecution claims hotel employees Sandip Moneea and Mr Treebhoowoon murdered Mrs McAreavey when she returned to the room at the exclusive beachside complex and caught them stealing. Mr McAreavey revealed how he was treated by police following his wife's death. He said four officers drove him away from the hotel in a jeep. "Further up the road they pulled in at the side of road and a couple of the policemen got out and they went to side of road to a fast food thing and they got themselves something to eat," he said. He said he was then taken to a derelict-looking building where he was put in a room and officers took off his shirt and examined him for marks. "I could see what was going through their minds," he said. "They put handcuffs on me and I was sat down on a bench." Mr McAreavey said he was then left alone. "It was for at least five hours, I'm sure, more - actually it was late into the night." He said he was eventually released after making a statement and returned to the hotel where a nurse cared for him through the night.